The Art Gallery of Grande Prairie (AGGP) is proud to invite the community to attend Gifts and Gestures, an exclusive look at a project, led by Curator Derrick Chang and Edinburgh based artist, Benny Nemerofsky Ramsay, which physically restores an aging piece while exploring how lost histories can be brought to life. The painting at the center of the project is titled Consummation (1985), created by celebrated Canadian painter William Perehudoff (1919-2013). In 1999, Perehudoff was made a member of the Order of Canada for his contributions to Canadian painting. The work was donated to the Gallery in 2015 and belonged in the private collection of art critic Karen Wilkin. The artwork was created and presented as a wedding gift to Wilkin in 1985, but has not been seen by the public since that time. The project, a collaboration between AGGP Curator of Exhibitions and Collections, Derrick Chang and invited artist Benny Nemerofsky Ramsay, will open up a discussion around the painting’s restoration, its history, and the complex notion of the work of art as a gift, not only as a wedding gift, but also as a gift to the Gallery for the enjoyment of future generations. “For a curator, the pleasure of working with a collection is in being asked to interpret, investigate and preserve the history of works of art,” said Chang. 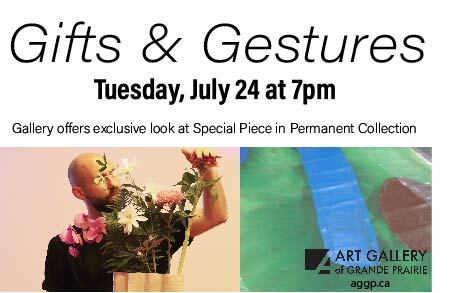 This special event will be held on Tuesday, July 24 at 7:00 pm at the Art Gallery of Grande Prairie. The project is generously supported by the British Columbia Arts Council.